Unique Wedding Veils … Will you listen to your inner voice and dress with your heart? Or will you allow convention to dictate your choices? The bride below chose to step outside the wedding box and take a step on the ‘wild side’. Ok…the photo above is not quite a step on the wedding ‘wild side’, but the Swiss Dots on the veil and the bow are rather unconventional. 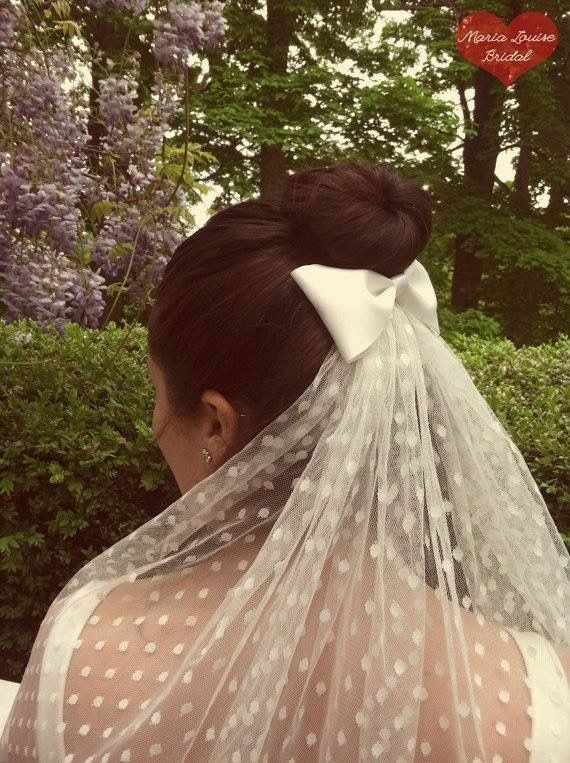 I rather like it, as long as the dots do not fight for dominance with the bride’s dress. Your wedding dress should always be the star. How about the headdress above? I can’t quite make myself call it a ‘veil’. I’ll be honest here, I would never chose it, nor would I encourage my daughters to do to. Perhaps the view from the front is spectacular? Maybe it frames her face fabulously? Hummm…the cap below is just that, more of a cap than a veil. It serves the purpose of wedding headgear, but no one would call it traditional. The mantilla below is a wedding staple. In my humble opinion, one must have just the right face shape to pull it off. The bride below does. My only concern, but I have the same one for all the brides on this post, there is no veil over the face. To me, a veil covering the bride’s face as she walks down the aisle makes a ‘bride a bride’. Do you ever start a new mystery series and feel an instant connection to the main character? It doesn’t happen often for me, and It’s a rare treat when it does. Such is the case with Murder Once Removed. Lucy Lancaster, the heroine in Murder Once Removed, is a charmer. I think she and I would be great friends. S.C. Perkins debuts her new ancestry detective cozy mystery series Tuesday March 19, 2019. I had the honor of an advanced reading, and I will be counting the months until Perkins releases her second installment. “Except for a good taco, genealogist Lucy Lancaster loves nothing more than tracking down her clients’ long-dead ancestors, and her job has never been so exciting as when she discovers a daguerreotype photograph and a journal proving Austin, Texas, billionaire Gus Halloran’s great-great-grandfather was murdered back in 1849. What’s more, Lucy is able to tell Gus who was responsible for his ancestor’s death. This mystery is so well-written, one thinks it surely must have been written by a more seasoned author instead of Perkins’ debut. 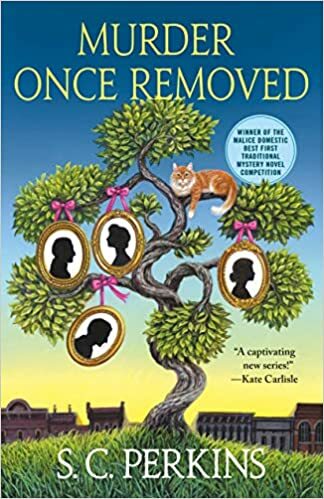 Murder Once Removed is tightly penned with a great plot, fun characters, (at times comically so), and will keep you guessing. You still have time to pre-order, and I encourage you to do so! Would you like to order your own copy of this great read? Just click on one of the links below to be taken directly to your favorite bookseller’s website. Below, the beautiful Stephanie Perkins (S.C. Perkins). I hate to admit it, but she’s as lovely and warm as she is beautiful. I wrote a post about Blue Wedding Shoes, (if you’d like to read it, just click on the link), but how about blue jewelry for your wedding? We all know the old saying, “Something old, something new, something borrowed, something blue.” It seems to be one of the traditions that most brides are still adhering to. Lots of brides are choosing blue wedding shoes, both my daughters did. I love this idea! 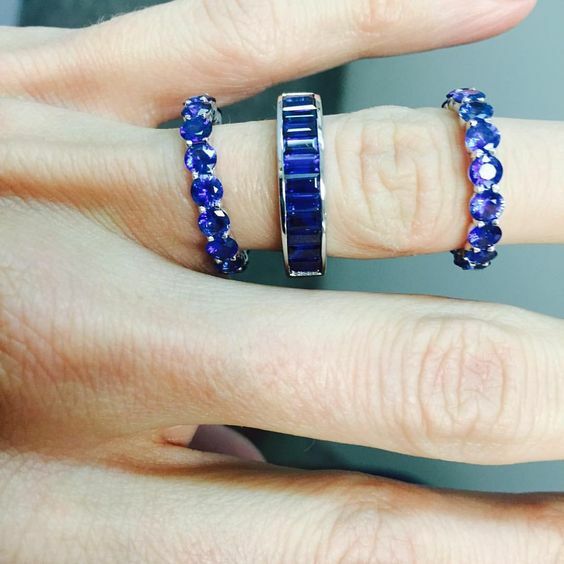 But how about blue jewelry? Love, love the ring below. Want to go with a gemstone that is a little more traditional? 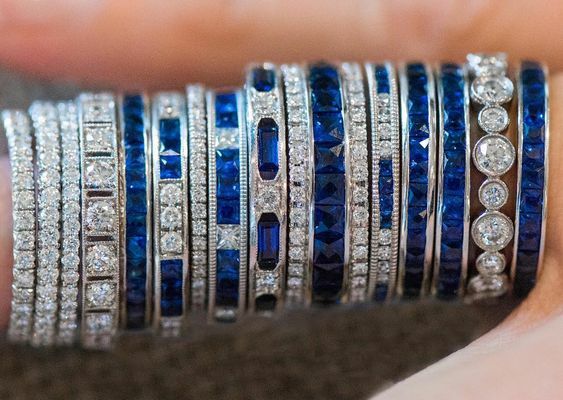 The above photo with all the sapphires makes my heart swoon! I love rings that I can stack. If you choose to go necklace free, then these earrings are for you. I’m not a fan of BOTH necklaces AND earrings, unless are very understated. You want your guests, to focus on you, not your jewelry. Remember, your jewelry should compliment you and your style, not dominate it. 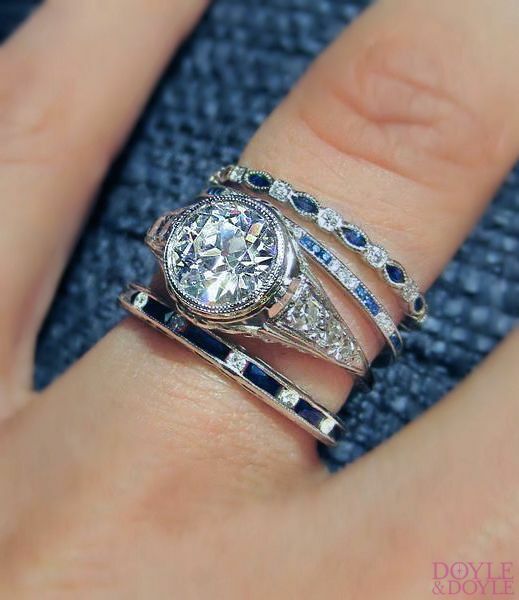 If I had it to do over again, I’d choose a wedding band with colored stones. I love the combination above. Remember, as with all things in your wedding, there is not right or wrong, unless you hurt feelings. Your wedding day is all about your choices and your taste. So have fun with it! Take a step on the wild side if you want. No matter what you’re choosing, from food to venue, if you like it, and your fiance does, go for it! Hopefully, this is a once in a life time event. Don’t have second thoughts! 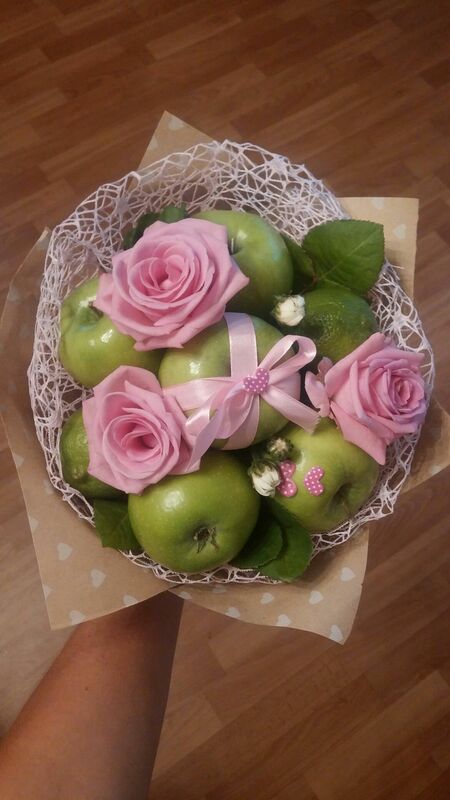 The concept for “Edible Bouquets” is not new. Isn’t there even a chain store that specializes in such things? But Edible…Wedding Bouquets? That’s a new one for me. What do you think of the idea below? Cotton candy as a wedding prop instead of flowers? Novel, yes, attractive (in my humble opinion…no). But it does create a cute scenario for a photo op. Seriously?? A PIZZA bouquet? This bride must know the way to her groom’s heart! I think sometimes people are searching for something new to do to make their weddings stand out, but they run the risk of doing something silly….like this! 🙂 I bet this bouquet wouldn’t make it to the reception’s end. 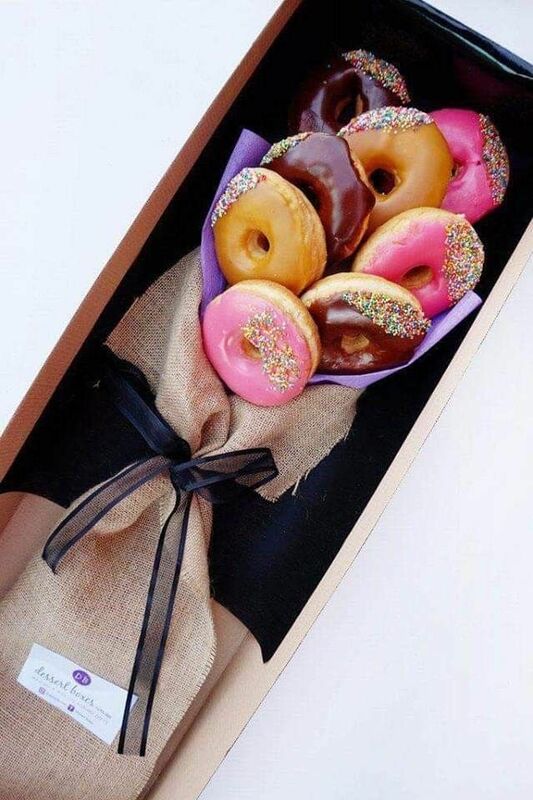 Ok…the bouquet below is kinda cute. And the upside, it could be a delicious late night treat for the bride and groom after the wedding! Ditto the bouquet below. But there is nothing particularly special about a bunch of donuts together. Is there? The burlap wrapper doesn’t help. While not a bouquet the bride or her attendants would carry, the creation below would make a very colorful/pretty centerpiece. And just think, each person could take a section home as a favor! I bet not many of these pretty centerpieces would be left at the end of the reception! Perhaps the lovely apple centerpiece wouldn’t be such a big hit with the guests but I rather like this one. And while labor may be the same to create this time of decoration as a floral one, I imagine the supply costs would be less expensive. And who knows? I bet it could be a great “do ahead” DIY project for the bride and her family. Anything to save a few dollars for the shocking cost of weddings these days!